The Haddonfield moms and daughters with tennis coach Jeff Holman. Back row (from left) has Susan Parks, Karen Wallace, Susan Hodges, Holman, Deb Whiting, Joana McDonnell and Phoebe Figland. Bottom row has players (from left) Molly Parks, Lily Hanna, Paige Hodges, Becca Whiting, Alexandra McDonnell, and Gillian Rozenfeld. 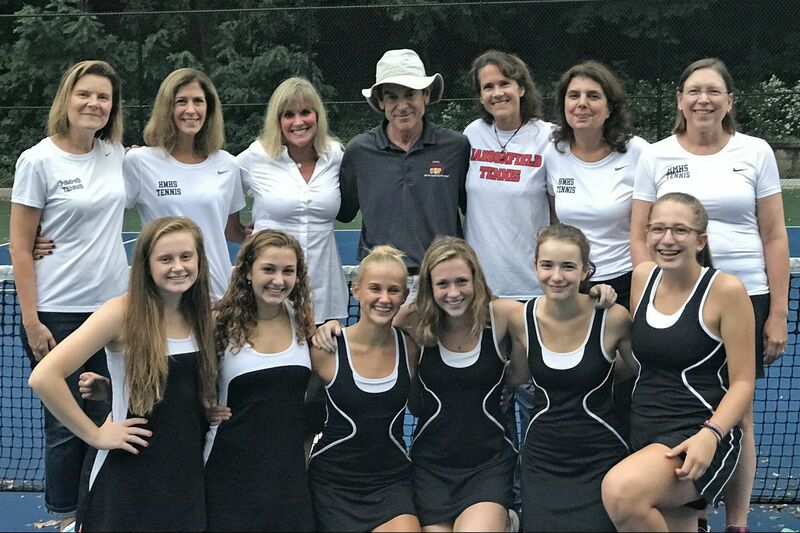 The rich tradition of Haddonfield girls' tennis is never far from the Bulldawgs when they take the court under veteran coach Jeff Holman. This season, it's right there on the other side of the fence. On Thursday, Haddonfield will set its sights on the program's 20th state title at the annual team championships at Mercer County Park. The Bulldawgs won their 37th South Jersey title on Monday. But the twist this season is that the program's enduring excellence has been on display among both the players and spectators. Haddonfield (22-3), which meets Holmdel in the Group 2 state semifinals Thursday at 9 a.m., has six athletes on the roster — including four in the seven-player starting lineup — whose mothers also played for the Bulldawgs under Holman. "It brings tears to my eyes just thinking about it," said Karen Wallace, a standout player in the early 1980s whose daughter, Lily Hanna, is the team's No. 3 singles player. APRIL SAUL / File Photograph. Holman chats with his players during a match against Sterling in 2013. He is in his 43rd season. All of the mothers played for Holman in the 1980s. Susan Parks was a No. 1 singles player, and her daughter, Molly Parks, is the team's current No. 1 singles player. Phoebe Figland was a No. 2 singles player in her day, and her daughter, Gillian Rozenfeld, is the team's No. 2 singles player. Deb Whiting played second doubles during her career, and her daughter, Becca Whiting, plays second doubles. In addition, former players Susan Hodges and Joana McDonnell have daughters who are members of the team — Paige Hodges and Alexandra McDonnell, respectively. "It's very rewarding," said Holman, who has a career record of 1,144-147 in his 43rd year as the coach of the girls' program. "These women all played for me, and for them to have their daughters all play for me as well, it means a lot." Whiting, a 1983 graduate, said playing tennis for Haddonfield under Holman was the best part of her high school experience. "It's just wonderful that our girls can have the same experience," Whiting said. "It really all goes back to Jeff. He's such a wonderful mentor, has such a great spirit about him." Joana McDonnell said she wasn't a top player in high school but enjoyed being part of the program. She said the same is true for her daughter, who still is relatively new to the sport. Hodges raved about Holman's "quiet way" of bringing out the best in his athletes. "He's so kind," Hodges said. "He makes you want to play even better than you are." Holman, holding the Group 2 state championship trophy, gets a hug from Jocelyn Perry after winning the title in 2008. Holman said he hasn't changed his coaching style in his long career. "I've learned a few things as far as the best way to put together a lineup," Holman said. "But as far as the way I've interacted with the girls, I don't think that has changed. To me, the most important thing is positive reinforcement." Holman's greatest trick as a coach probably has been his ability to build a program that is both competitive and inclusive. Haddonfield has a no-cut policy and culture that encourages every player — from the No. 1 singles on the varsity to a first-year player struggling to master the basics of the sport — to feel she is an important part of the team. "That's what he does," said Wallace, who graduated in 1984. "He just has this special way about him." Ridgewood vs. Bridgewater-Raritan, 11 a.m.
Montgomery vs. Cherry Hill East, 11 a.m.
Northern Highlands vs. Millburn, 11 a.m.
West Windsor-Plainsboro North vs. Moorestown, 11 a.m.
Demarest vs. Summit, 9 a.m.
Haddonfield vs. Holmdel, 9 p.m.
Kinnelon vs. Mountain Lakes, 9 a.m. Shore vs. Woodstown, 9 a.m.
Holy Angels vs. Pingry, 1 p.m.
Newark Academy vs. Moorestown Friends, 1 p.m.